The team huddled together before the game. 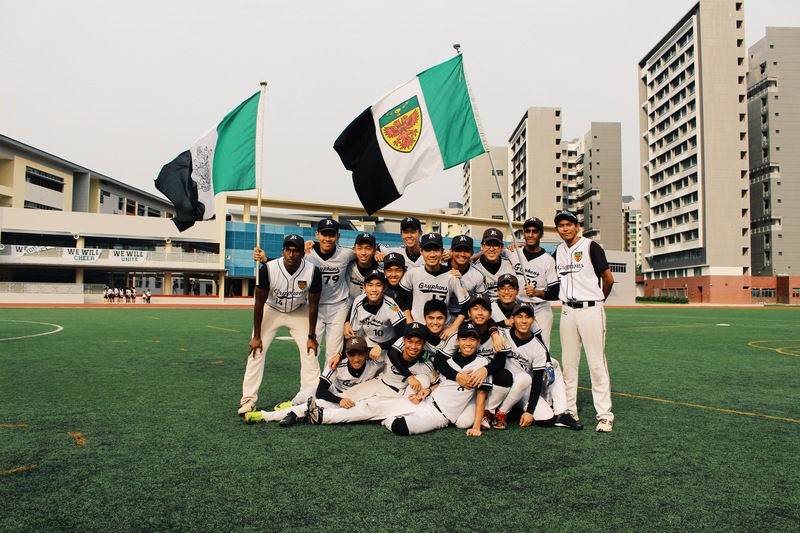 On the 8th of May, the Raffles Softball A Division Boys team played their national school championship finals against ACS(I). Despite the stormy weather and showers before the game, the boys looked excited and ready to play. RI was undefeated thus far, and had beaten ACS(I) in the preliminary rounds by a landslide victory of 9-0. There was a strong showing of support from alumni and schoolmates alike as many looked forward to seeing RI battle against ACS(I) as the defending champions. To give some context: softball is a complicated game but simply put, consists of 5 innings each divided into two halves. The first half sees one team bat and try to score runs, while the other team occupies the field and tries to record 3 outs. In the second half, the teams reverse their roles. The team that scores the most runs (points) wins the game. The defensive innings were unremarkable early in the game – Edward Lee (15S03K) struck out the first 3 batters easily to hold ACS(I) to no runs. Now it was RI’s turn to score: though Ye Zi An (15S03D) managed to bring Jonathan Chua (16S06D) back home to score our first run, we were unable to capitalize on this momentum, and the first inning ended 1-0 to RI. Urged on by RI’s batting, the batters from ACS(I) fought back valiantly. ACS(I) made the first hit of the game in the second inning, but Benjamin Loke (16S06F) made a diving stop to prevent the runner from advancing further. More hits ensued, but thankfully, tight fielding and solid defensive plays by RI ended the inning with no runs from ACS(I) as we breathed a collective sigh of relief. Offensively, we were aggressive; after being cornered at 2 strikes, Howe Lee (15S03U) hit a lead-off homerun, Hugo Tay (15A01A) pulled off a successful steal, and to cap it off Cher Wee Zheng’s (16S05A) hit to the outfield brought Hugo back home for yet another run. The fielders managed to shut out ACS(I) again in the third inning, and were eager to increase the score difference – which they did. With Daryl Kow (16S06R) on base, Andrew Tan (15S07B) hit another homerun, bringing both Daryl and himself in for 2 runs, as supporters belted out loud strings of cheers. The situation repeated itself as Hugo hammered the ball past the ACS(I) short-stop – Howe (who was on base) used this opportunity to score yet another run. ACS(I), desperate to fight back, managed to get a lead-off hit that went clear over the fielders. A series of pitching errors then lead to two more runners on base, and the bases were now loaded. The next hit drove the ball past the fielders, and one run from ACS(I) came in. Was ACS(I) mounting a comeback? The tides seemed to be shifting in their favour, but sharp fielding on our side prevented this. A quick and accurate throw from Zi An prevented a run from scoring while Benjamin easily fielded a ball for the third out. RI managed to hold ACS(I) to one run despite the precarious situation. Then came the 4th inning. With two runners on base, Daryl whacked the ball past the short stop, and both ran home for 2 runs; another hard hit from Howe lead to Daryl and Andrew running home for our 9th and 10th runs. Now the winning run was on second base – if the score difference was larger than 10, the game would have ended there without a need to play the last inning. Raffles was poised to win the championships, with just one out, and 2 runners on base. 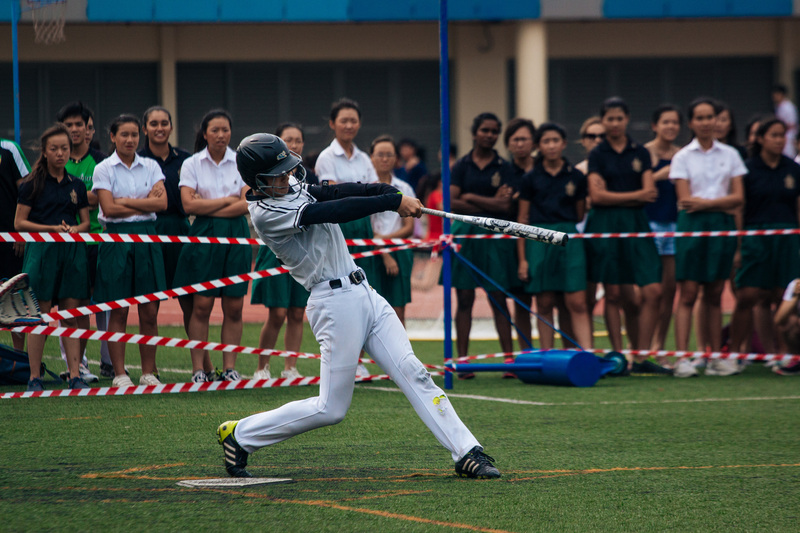 Wee Zheng then stepped up to the plate and drove the ball past the fielders, bringing Howe home to end the game with a final score of 11-1 to Raffles. Vice-captain Joshua Tam (15S06N) sums it up nicely: “Today was a good game, and I think we all played very well. There were some hiccups, but we gave it our all and it was the best game of our season.” And indeed, what a compelling win it was. 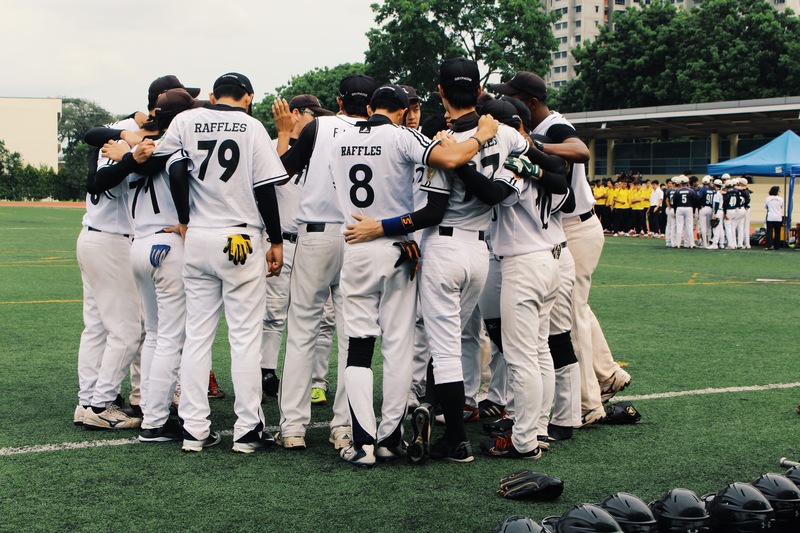 We at Raffles Press wish the softball boys all the best for their future competitions following their spectacular season this year!